Before she was an Oscar winner and Miss Congeniality, Sandra Bullock was in the charming romantic comedy, While You Were Sleeping. The film is a favorite of my mom’s, and growing up, I remember watching it with her whenever it popped up on cable from time to time. It wasn’t until I was older that I could appreciate how sincere this little rom-com is and just how romantic it is with its earnestness. Bullock plays Lucy, a single woman living and working at a train station in Chicago. 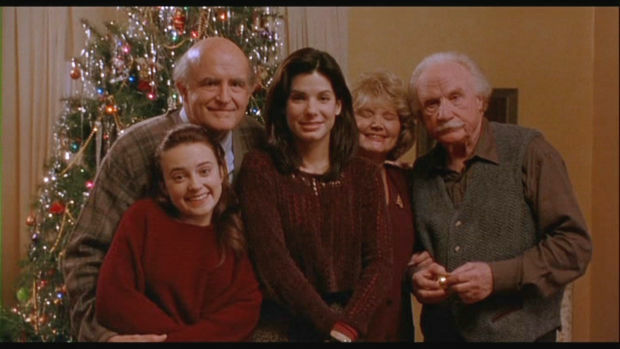 Lucy doesn’t have a family, her parents passed away, but she makes the most of her lonely life, hauling a Christmas tree up to her apartment to get in the festive spirit and admiring a handsome businessman (Peter Gallagher) who passes by her booth every day at work. One day, the businessman gets into an altercation that causes him to get pushed onto the train tracks. Lucy doesn’t hesitate, jumping out and saving the man from an oncoming train. This moment throws Lucy on a trajectory that is zany at worst and touching at best. Following the businessman to the hospital, she tries to find out if he’ll be okay, but the doctors yell “family only!” which causes Lucy to mutter wistfully that she was going to marry him. A nurse overhears her and takes what she said literally, bringing Lucy to see Peter (the businessman) and abruptly introduces Lucy to his family as his fiancee – much to Lucy’s shock. To give her credit, Lucy does immediately attempt to clear up the misunderstanding, but Peter’s family, who clearly weren’t very close to him, embrace and thank her vehemently for saving his life. Lucy is at a loss for words and ends up pretending to be Peter’s fiancee. So, what’s Peter doing with all this? He’s still unconscious. While You Were Sleeping is at its best when Peter is unconscious. Lucy assumes her new pretend role and in turn remembers what it’s like to be a part of a family. It’s Lucy’s loneliness during this time of the year that immediately makes you understand why she would carry on with such a lie. It’s not so much that she’s afraid to tell them the truth; Saul, who discovers the truth early on, tries to scheme with Lucy the best way to get through this lie. It’s that she finally belongs somewhere and it is a gift that’s hard to give up, especially when Peter’s family is as kind, open and genuine as they are. As if everything wasn’t already very complicated, Lucy meets Peter’s brother, Jack (Bill Pullman). Jack is skeptical of Lucy at first because “she’s not his type,” but in no time, Lucy manages to charm Jack – a little too much. Before you know it, Lucy finds herself falling for Jack even though she’s “engaged” to his brother. Bullock is wonderful in this movie and it’s a true showcase of her affable screen presence. Pullman is just as magnetic and shares a completely swoon-worthy chemistry with Bullock. They bring so much life to their characters that it’s endearing to watch. While the romance is palpable, the humor is just as great. The hijinks with Peter’s boisterous but loving family are great, and the comedic awkwardness when Lucy has to prove she really knows Peter by revealing that he only has one testicle is pitch perfect. This isn’t the type of romantic comedy that works off cliches or tries too hard, which we get too much of these days. While You Were Sleeping is plainly a good movie that capitalizes off a crazy plot but makes it work by infusing it with a ton of charm and heart. Previous ArticleJon's Movie Review: You'll Fight Back Yawns In "Seventh Son"
Next ArticleTV Review: 12 Monkeys 1x04 - "Atari"